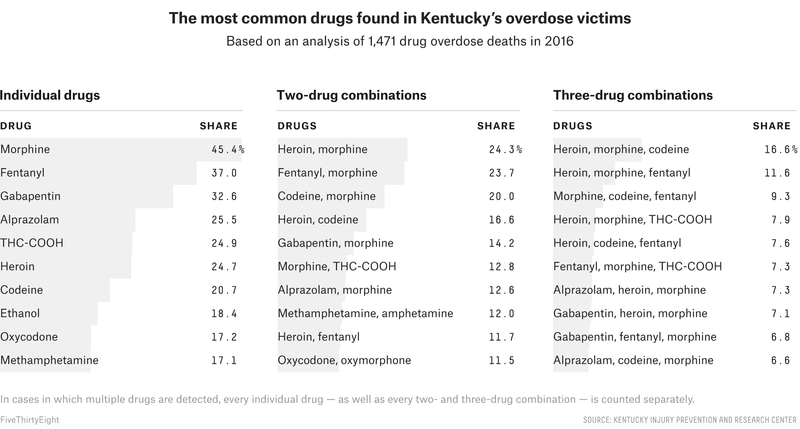 To better tackle the epidemic, Kentucky needed to know which drugs were causing lethal overdoses. Sarah Hargrove didn’t expect to be on the front lines of a national emergency after getting a master’s degree in forensic science. But the opioid crisis has put her there. A Chicago native, she moved to Louisville, Kentucky, in 2012 to work as an autopsy technician in the office of the state’s chief medical examiner. She prepared bodies for examination and assisted doctors with death investigations. She loved doing the hands-on work and helping to answer questions about what caused a person’s death. “I’ve always been very interested in puzzles,” she told me recently. You may think of politicians, first responders and physicians as the people best-equipped to stop the opioid crisis. And they do have an important role to play. But so do coroners and medical examiners. 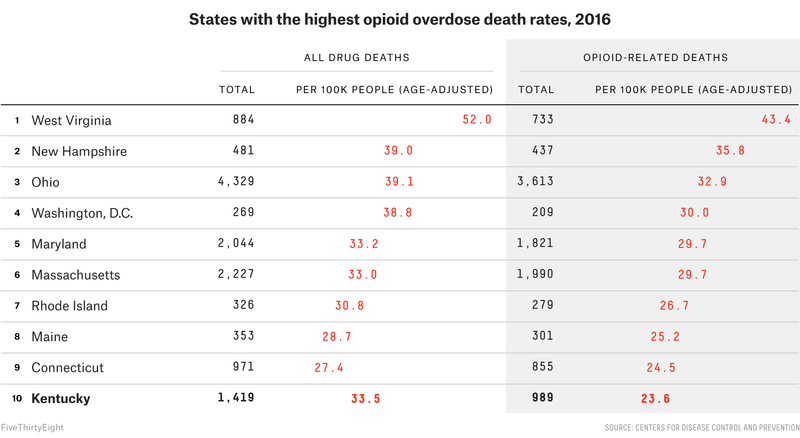 The government and media generally quantify the nation’s opioid problem on only one dimension: how many people have died. Hargrove and Kentucky are working to provide an additional dimension: exactly which drugs — either prescription opioids or illicit ones like heroin and synthetic fentanyl — led to a death. Armed with even that one extra bit of data, a state can fight its opioid crisis in a new way. The opioid epidemic continues to ravage the country. Official numbers from the federal Centers for Disease Control and Prevention show that overdoses from drugs — legally prescribed or otherwise, including opioids, hallucinogens and other narcotics such as cocaine — killed about 63,600 people nationwide in 2016, a 21 percent increase from the year before. Of those, over 42,000 — roughly 66 percent of the total — involved some kind of opioid.1 In some areas, coroners are overwhelmed by how many people are dying, and morgues are running out of space. Kentucky has been hit particularly hard. There were 1,419 reported overdose deaths in 2016 — 33.5 per 100,000 people,2 according to the CDC. Of those deaths, 989 — 23.6 per 100,000 people — involved some type of opioid. 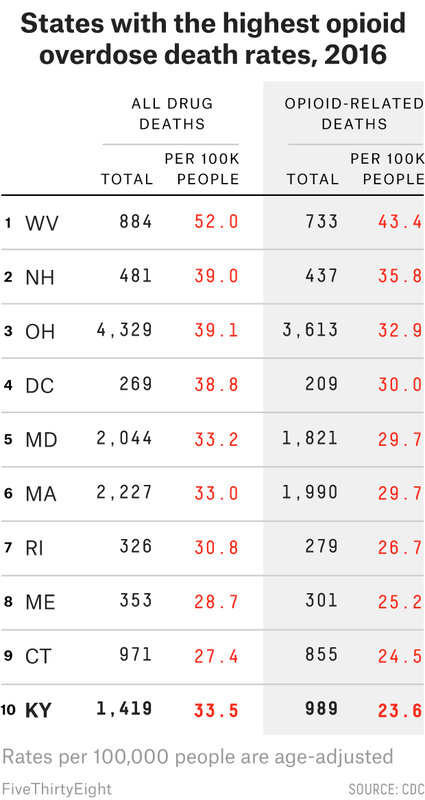 Those are some of the highest rates in the country. Over the past year, first responders have seen significant overdose spikes throughout the state. The Kentucky Injury Prevention and Research Center is one of the organizations trying to put the puzzle pieces together. A partnership between the state Public Health Department and the University of Kentucky College of Public Health, the center is investigating the causes of the state’s drug overdoses to help policymakers make more educated decisions about how to tackle the crisis. That means improving the accuracy of death certificates and other available data and encouraging law enforcement groups, public health officials and other state agencies to communicate with one another better. The center started working with drug overdose mortality data in 2011 and quickly realized how limited death certificate information on how someone died and what killed them was. The efforts that KIPRC and the state have made to improve this data have led to crucial findings, including that Kentucky’s crisis isn’t one crisis, but many. Different parts of the state are afflicted with different drugs. Northern Kentucky, for example, has a high prevalence of heroin and fentanyl — a synthetic opioid that is more deadly than heroin and other types of opioids — while in the eastern part of the state, prescription opioids are still the main concern. Van Ingram, executive director of the Kentucky Office of Drug Control Policy, said he was able to push major legislation changes with the help of KIPRC’s research. In 2015, the governor signed into law a bill that increased the availability of naloxone, a drug used to reverse the effects of an opioid overdose, and supplied funding for treatment programs. “Armed with the information we received early around fentanyl, we were able to get funds to supply Narcan [the brand name for naloxone] across the state,” Ingram said. This means it matters what goes into KIPRC’s databases. National statistics on drug overdoses come from death certificates. But because the death investigation process is typically done on a local level, the cause and manner of a death may be recorded in different ways, which can affect how deaths are classified. For example, a single drug may be listed on a death certificate when multiple substances were actually involved in an overdose. When Hargrove became a data management analyst for KIPRC, she started pointing out discrepancies on death certificates. Even the smallest differences in language can leave overdose deaths uncounted. At first, Hargrove was confused by how many overdose cases weren’t making it into the DOFSS database. Eventually, she figured out that some deaths that involved more than one drug were being left out because they were being listed as “polysubstance intoxication” or “multiple substance overdose,” without giving the specific name of the drugs involved. Also, the word “substance” was triggering the classification of these deaths into another category altogether. Hargrove communicated this issue to the chief medical examiner and county coroners, pushing for this type of death to be listed as a “multi-drug overdose” instead. Prompted in part by experiences like that, Hargrove is now trying to rally all 120 coroners across the state to collect death-certificate information more uniformly. The center is also forming collaborations with the state’s police forensics lab and local emergency medical services that will help them better track the opioid epidemic across the state. This is the type of work that President Trump’s commission on the opioid crisis recommended bolstering in its November report. Specifically, it mentioned improving how overdose death investigations are conducted, including how drug testing is done. The country does not have “sufficiently accurate and systematic data from medical examiners around the country to determine overdose deaths, both in their cause and the actual number of deaths,” the report said. That’s in part because the people we’re relying on to generate our data around opioid overdoses have limited resources and funding to work with. There are two main professions that are recording information for death data: coroners and medical examiners. In Kentucky, each county elects a coroner, who performs death investigations to record the cause and manner of death on death certificates. Many of them have little, if any, medical experience. Death investigations can involve forensic work, examinations of evidence that is found at the scene of a death, and exploration into the lives of the deceased for context such as medical history. Danny Finley has been the coroner for Clay County, a rural area in the southeastern part of the state, since 2011. But that’s not his primary job. He’s an insurance broker working primarily in health care and a licensed funeral director, although he’s not currently active in that role. At the time he was elected, Finley said, Clay County was in the midst of a serious drug problem. According to KIPRC, the county of roughly 22,000 people had 25 drug overdose deaths that year. But it wasn’t clear which drugs were responsible, so Finley couldn’t tell whether the county’s drug problem was the same or different from those in other parts of the state. The medical complexities of overdose deaths and the rise of new drug derivatives3 mean coroners need more help now than ever. In Kentucky, that’s where medical examiners come in — they assist coroners when a death is unusual or sudden by performing autopsies. Kentucky has four regional medical examiner offices staffed with forensic pathologists, doctors who examine bodies after death, but the annual caseload is overwhelming the system. “The medical examiners are on call pretty much 24/7,” Hargrove said. The chief medical examiner’s office in Kentucky operates as a central information center to collect reports from coroners. In 2012, Kentucky tried to standardize part of the process for recording which drugs were involved in a death by requiring coroners to seek a post-mortem toxicology screening for every death suspected of being a drug overdose. The screening tests all overdose cases on the same standard panel of drugs, including several prescription opiates, heroin and fentanyl. The state’s chief medical examiner reads through every toxicology report submitted, and that information feeds into the KIPRC database. Because national data on drug overdose deaths is derived solely from death certificates, it adds a public health component to a coroner’s job. But there is no national agency regulating the quality of death investigations or ensuring that cases are conducted in a standardized way. It’s up to states or counties to establish a clear standard for investigating deaths and recording information on death certificates. Since then, Finley said, there has been a collaborative effort among hospital emergency department practitioners to better educate county residents on the dangers of misusing prescriptions and to stop overprescribing opioids and benzodiazepines, a class of drugs typically used for anxiety or panic disorders. KIPRC has already seen some success with its method of combining multiple sources of data to get more accurate information on the scope and specifics of Kentucky’s opioid crisis. Using the state’s DOFSS system, the researchers were able to determine the specific drugs that were involved in 97 percent of drug overdose fatalities in 2016; that’s compared with 82 percent using deaths certificates alone. Additionally, the researchers used DOFSS to find which drugs were most commonly involved in deaths linked to a combination of substances, as well as which drugs were involved in overdose deaths among people of different age groups and genders. For instance, according to the findings, gabapentin — a prescription anticonvulsant (not an opioid) that is often prescribed for nerve pain or epilepsy and reportedly is being misused — was the drug most frequently detected in women who had died from drug overdoses and among victims over the age of 44. One of the additional collaborations that KIPRC is forming will allow state police to match their drug-related data — police seizures and undercover buys, for example — with drug overdose mortality data, to help identify areas of the state at increased risk of overdose outbreaks. Researchers said the overlay of public safety and overdose death data can help public health officials further track drug trends as they move across the state. “The issues with heroin and fentanyl are huge in northern Kentucky,” Hargrove said. “What we’re seeing now, though, is that it’s trickling down the highway systems. The state police are very concerned about that and very aware of it.” That tracking ability means communities that are in a drug’s path can be better prepared for its arrival, by ensuring that treatment options are available, for example. Aside from data management, an important element of Hargrove’s job is to help county coroners across the state discover their roles as public health officials. Hargrove nodded to Finley as an official who has effectively helped rally a local community to fight the epidemic. According to a KIPRC report released in August, Clay County had only five overdose fatalities in 2016, a notable drop from the 25 it had five years earlier. Sheriff Kevin Johnson said the drop was due to several factors: statewide limits on how doctors can prescribe opioids, Finley’s helping law enforcement officials better identify trends, and improved enforcement efforts by officers. “It wasn’t one magic thing that happened — everybody kind of got together and understood the problem to figure it out,” Johnson said. To solve a puzzle this big, you need as many people working on it as possible. Because overdose deaths often involve multiple drugs, pinning down which directly contributed to a death can be difficult. All rates are age-adjusted by the CDC. Synthetic or chemically altered versions of drugs. For this analysis, we used the CDC’s WONDER database. We identified the codes for specified drugs from this journal article.